Today’s Gospel reminds us that Our Lord was not the Messiah everyone expected. The Messiah was supposed to overthrow pagans and oppressors, and the Romans in his time were occupying Palestine. Yet Our Lord finds something in this centurion that he hadn’t even found in the people who’d been prepared for his coming: a great faith. It’s not easy to surprise Our Lord, and in the case of the centurion he is pleasantly surprised. Our Lord also reminds us today that he came to save everyone, not just the Jews. Anyone who believes in him will receive healing and grace, pagan or otherwise. Advent should be a time of joyful expectation for everyone, because we’re celebrating the coming of Our Lord to give everyone an opportunity for salvation. Even baptized Christians sometimes live like pagans. Advent is a time to start fresh. 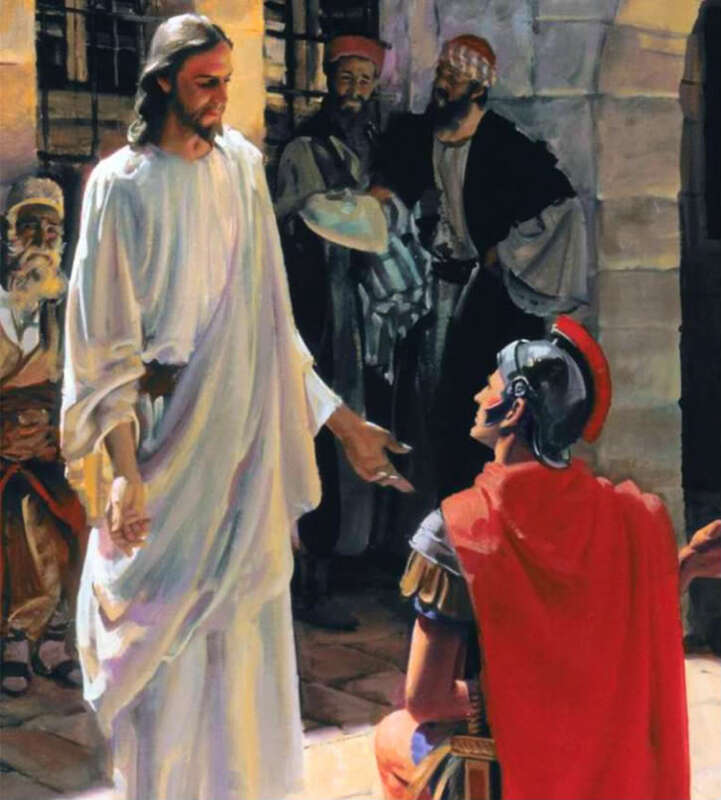 The centurion mustered his faith for the good of his servant, not just for himself. Let’s show concern for others this Advent. It’s the first step toward turning away from ourselves and, in faith, turning toward Our Lord. Readings: Isaiah 4:2–6; Psalm 122:1–9; Matthew 8:5–11. See also 12th Week in Ordinary Time, Saturday. Today in the celebration of the Eucharist there’s a change of color of vestments to celebrate a change of season. It’s not just that the weather is getting colder: today we begin a new season in the liturgical year and a new liturgical year. Yesterday was the end of the last liturgical year, and symbolized the end of time when Christ will come to definitively overthrow sin and death so that we can live forever with him and everyone we love. We celebrated that last Sunday by celebrating the Solemnity of Christ the King. This Sunday we begin the season of Advent. “Advent” means “coming.” Last Sunday we celebrated the Second Coming of Christ, which is going to come in the future; during Advent we prepare to celebrate the First Coming of Christ. Christ’s First Coming happened on Christmas. Actually, it happened at the Annunciation, which was when he became man and why that feast is also called the Feast of the Incarnation, but he was born at Christmas, which is also called the Feast of the Nativity. During the liturgical year we celebrate all the mysteries of Christ’s life, from the beginning of time, even before he became man and came to earth, until the end of time, when he will return and lead us to eternal life with him and everyone we love. We also celebrate the whole history of salvation during the liturgical year. In Advent we celebrate the start of the history of salvation, before Christ’s First Coming to earth at Christmas. In today’s Gospel Jesus is speaking about his Second Coming, but the question for both Comings of Christ is the same: How are you getting ready? How do you answer that question? It’s going to influence how you live Advent a lot. Is it “finally!”? Is it “yeah, right…”? Is it “yikes”? Those answers are not answers to what gifts you’re going to get, what family you’re going to see, or how much you’re going to eat: they’re answers to how you are getting ready for Christ’s coming at Christmas. The Second Reading and the Gospel today remind us that he is coming at an unexpected moment. For the Israelites that was nothing new, but what they didn’t imagine was that the Messiah, the Savior of the World, would come in such an unexpected way: as a little baby in a manger. What’s your response to the Savior of the World coming as a little baby and lying in a manger? Maybe the question “Are you getting ready?” takes on a different light when you consider how he is coming. For the Israelites, the coming of the Messiah was going to be at the end of time: he was coming to defeat all their enemies and clean house. Instead he came as a little baby, way ahead of schedule. How did they respond? Some saw a little baby in a manger and said, “he’s not the Messiah, come on….” Others didn’t even believe in a Messiah to begin with, and didn’t change their opinion: “yeah, sure, the Savior of the World…right.” Christians are often on the fence: Some have the same attitude as the Israelites and the skeptics, but others are saying, “yikes,” because the Second Coming is all they have on their mind, and they know they’re not ready. Advent is a time to get ready the real Christian way, just as today’s Psalm says: “Let us go rejoicing!” Rejoicing is the Christian way to respond to the question Jesus is asking in the Gospel today. In today’s First Reading Isaiah prophesies the coming of the Messiah as time of peace and blessings for all nations forever – that is cause for rejoicing. Isaiah’s prophecy began to be fulfilled in the First Coming, when the Savior of the World was born, and will be fulfilled in the Second. In the First Coming and the Second Coming Christ is not letting us go it alone. When St. Paul in the Second Reading today reminds us that “our salvation is nearer now that we first believed,” he’s reminding us that Christ is nearer to us now because he is one of us. God became man. At Christmas we’ll be celebrating the fact that God is with us as one of us. We have to do our part, we have to change our lives, but shielded by the “armor of light,” “putting on the Lord Jesus Christ,” as St. Paul encourages us to do: by living a Christian life we are helping Christ to fulfill that prophecy of Isaiah. Let’s begin Advent by preparing ourselves joyfully for Christ’s coming. The Lord has given us a whole liturgical season to get ready for his Coming: four whole weeks. Ask him to help you keep him in the center of your preparation for Christmas. Christmas is going to be a time for family, friends, and rest, but it is also a time for rejoicing, because the Savior of the World is going to be born. Let’s start Advent with joyous expectation. Readings: Isaiah 2:1–5; Psalm 122:1–9; Romans 13:11–14; Matthew 24:37–44. See also 21st Week in Ordinary Time, Thursday. We can fall at times into the trap of thinking that there are never fairy tale endings or living “happily ever after,” but in today’s First Reading John paints that happy ending and at the end of his Revelation says, repeating what he was told, “These words are trustworthy and true.” There will come a day when there’ll be no more night, no more want, no more evil, no more mysteries. Forever. The light of God in today’s First Reading is not just physical illumination; it is full “disclosure.” The mysteries of God will be revealed, and we will see him as he is. In that knowledge we’ll see ourselves as we truly are: children loved by Our Heavenly Father forever, cherished, safe, and secure. That day may be at the end of history, but we shouldn’t relegate it to that moment. The thought of it should bring a little warmth and light to us even in today’s world still struggling against sin. Let’s ask Our Lord to let just a ray of that future light shine on us today to encourage us and help us continue to strive for living happily ever after. Readings: Revelation 22:1–7; Psalm 95:1–7b; Luke 21:34–36. See also 34th Week in Ordinary Time, Saturday and 21st Week in Ordinary Time, Friday. In today’s First Reading we come to John’s vision of the Last Judgement. The thousand years in which the Devil will be imprisoned represent the time from Our Lord’s victory over sin and death in the Resurrection and the time he returns in glory. During those same thousand years those who sit in judgement at Our Lord’s side are those who’ve been victorious over sin and death through baptism and reign with Our Lord. After that time even the Devil will be released briefly to face judgement at the end of time. On that day everyone will be raised from the dead and face final judgement before Our Lord himself. In today’s Gospel Our Lord says that heaven and earth will pass away, but his Word will never pass away. That Word of life in this moment becomes a moment of glory for those who did not succumb to the Devil or the beast, and a Word that makes the unrepentant realize they’d made the biggest mistake of their life. The world as they know it, and we know it, will be over. The sea in John’s vision disappears because it was the home of the dragon. The just will form part of the new Jerusalem, the spotless bride of the Lamb–the Church–living in a new Heaven and Earth. Christ’s reign has already begun and those who strive for holiness already reign with him. Let’s continue to work so that others reign with us: by sharing the Gospel with them. Readings: Revelation 20:1–4, 11–21:2; Psalm 84:3–6a, 8a; Luke 21:29–33. See also 34th Week in Ordinary Time, Friday and 33rd Sunday in Ordinary Time, Cycle B. A recurring expression in St. John Paul II’s encyclicals is that of “structures of sin”: from people’s sins an entire commerce and social structure of sin is constructed that propagates more evil and sin. In describing Babylon fallen in today’s First Reading John is envisioning one day when sin and evil “go out of business.” Not only will the demand dry up, but the supply as well. Babylon becomes a desolate and deserted city that attracts no one and no longer provides “markets” for the vendors of iniquity. There’ll be no more trafficking of someone or something, and the glamour of evil, against which we promised to be the day of our baptism, will be revealed for what it is, degraded, demeaning, and worthless for the supplier as well as the consumer. Today’s Responsorial Psalm, taken from the First Reading, is “Blessed are they who are called to the wedding feast of the Lamb.” When the bishop or priest in Mass holds up the Eucharist he says these same words as we look upon Christ in the Eucharist, the Lamb who has ensured that one day evil will never menace us or tempt us again. We too should rejoice in the little victories over sin and evil today, but especially persevere in hope as we continue to wage the good fight. Evil today may be glamorous, even fashionable, but in faith we’re not buying, confident that others will bankrupt the commerce of of sin as well. Readings: Revelation 18:1–2, 21–23, 19:1–3, 9a; Psalm 100:1b–5; Luke 21:20–28. See also 34th Week in Ordinary Time, Thursday and 32nd Week in Ordinary Time, Friday.